Peaches are good but paired with shortcake, they are even better. Learn how to make peach shortcakes with Jenna Weber's recipe in a full post on the Fresh Tastes blog. Whisk together the flour, salt, baking powder and sugar in a large bowl. Pour in the cream and mix until wet and shaggy looking. Knead only a couple times before rolling out to 3/4" thick on a floured surface. Cut large circles of dough using the bottom of a glass mason jar (or biscuit cutter). Place biscuits on baking sheet and brush tops with melted butter. Bake for 13 minutes. Let biscuits cool while you prepare the peach filling. Bring a large pot of water to a boil. Drop in the peaches for 10-15 seconds then immediately remove with a slotted spoon. Discard water. Peach skins should, at this point, peel off very easily. Peel skins completely and then slice peaches into 1/4th" segments. Place peaches back into the pot and add the sugar, cornstarch, cinnamon and lemon juice. Bring to a simmer and cook until mixture is very thick and peaches have broken down slightly---about 8 minutes. Stir in vanilla extract then remove from heat. Whip remaining cream until it holds soft peaks. 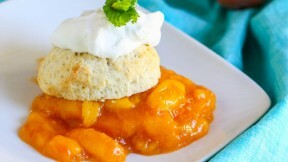 To assemble shortcakes, split biscuits down the center and spoon some peach filling generously on top of half a biscuit. Top with other biscuit half. Spoon a dollop of freshly whipped cream on top and a little sprig of mint. Enjoy immediately.